If you are wondering How Headgear Braces Can Improve Your Smile? Know all what you need to know about the headgear braces recommended by the dentists/orthodontics. Who doesn’t love to flash an icy white smile with a sparkle like diamonds and perfectly align teeth? Yes sure, we all agree that smile is a die for but besides the perfection, teeth alignment can cause a number of unwelcomed issues. So if you have malocclusion (before you reach for the dictionary, it means misaligned teeth) then you are going to be the one refraining from giving your biggest smile for pictures. There are multiple solutions to fixing your smile. We all know about braces and quite honestly, I think they are cool. But a less cool option is wearing a head gear and needless to say, it works wonders in aligning your teeth. However, headgear braces can improve your smile wonderfully, compared to anything else, when it comes to straightening your teeth. Sometimes your teeth don’t find enough space to grow and hence just grow crooked into the little space they get. With a headgear, your upper and lower jaws are targeted. It allows the jaws proper growth and you may get one of two gears, one goes around the back of your neck and the other goes around your head. Headgear braces are the dental appliance which is preferred by many orthodontists for a proper alignment the face and the jaws along with the teeth. It also guides the proper growth of the teeth in the right direction and also reduces any type of space present between them. Let’s take a close look at how headgear braces can improve your smile. 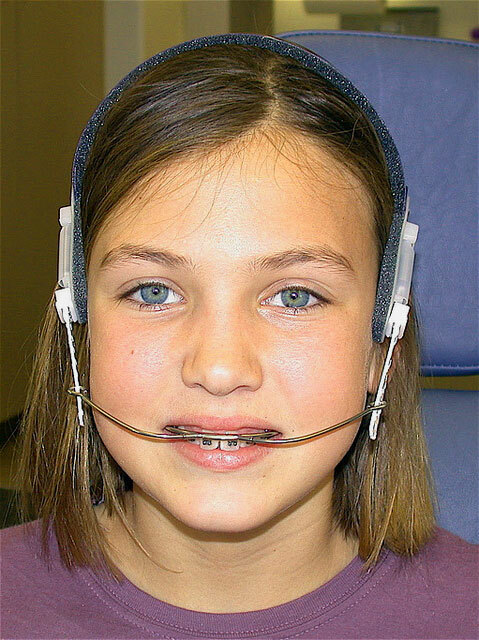 Headgear with braces is usually prescribed to children and very rarely to adults. If a patient’s jaws are not growing in the right direction or are not developing properly then it is necessary to support the teeth with something which is out of the mouth. That thing is a headgear which is attached to the braces with the help of wires which anchor the teeth through it. A headgear is usually worn either on the head or on the back of the neck. Many people feel awkward while even thinking of wearing a headgear. However, many orthodontists recommend it especially among young kids. Sometimes not only the teeth are unaligned, but the growth of the teeth is not right as well and the gap between the teeth is also increasing. In such cases, braces cannot do their job alone, and need the support of a headgear as well. The headgear aligns the teeth in a proper direction and guides their properly. Sometimes when a tooth extraction is done, the other teeth tend to grow towards that empty space. A headgear is prescribed in such a case to act as an extra anchor point. If you are prescribed a headgear, there is a huge chance that initially you will feel a lot of discomfort and soreness in your teeth. But remember that no pain, no gain. You should bear with it for a few days as gradually the discomfort will go away within a week. You can easily take Tylenol or even Aspirin in the case of soreness. However, if the condition persists for more than a week or is to worse to bear, then you should go and visit your orthodontist as soon as possible. You can also wear the headgear a bit loosely during the first two weeks and can gradually tighten it to the position as recommended by your doctor. In this case, the wearing of the headgear will become an easy process. Remember not to stop wearing your headgear at all during the initial days as you will then have to go through the whole ordeal of getting the headgear fit all over again. You should also take really soft and easily chewable food during the start to easily get used to eating while wearing a headgear. Please check out the the face and smile before and after headgear braces. Be really careful while wearing a headgear. Take special care while removing it as you can hurt your eyes, head and nose. Remove your headgear while sleeping. Remove your headgear while playing any sport or taking part in any sort of physical activity which requires a lot of effort and force. Make sure that nobody grabs your headgear by force. If you have a child who wears headgear to school, instruct the teachers regarding why it is necessary to make sure that he stays safe. In case you break the headgear, take it to the orthodontist so that it can be fixed. Do not try to fix your headgear by yourself. Follow all the instructions given to you by your doctor. Remember that every person prescribed with a headgear will have a different set of instructions as compared to another. So never try to follow something which has not been instructed to you. Wear your headgear as much as possible. There is no harm in taking it off when you are out to work or when you are planning to go outside on a party. However, do make up for the lost time by wearing it more when you are at home. By wearing your headgear for as long as possible will help you in adjusting the alignment of your teeth, jaws and face. Remember that the more you wear it, the sooner you will be able to get rid of it. Make sure that the hooks of your headgear are attached properly with the teeth, so that you can get positive results. In case you accidentally hurt yourself while wearing a headgear or when you take it off, go to your doctor immediately. Do not eat, drink and brush your teeth while your headgear is still on. In case your orthodontist prescribes you a certain toothpaste or even a toothbrush, make sure that you use them only for brushing your teeth. We hope, it has been pretty much explained that how headgear braces can improve your smile. It might be an open invitation to bullying but let’s look at the bigger picture here. A headgear will target your face and jaws as a whole, so you are treating much more than just crooked teeth. But if you need not just your teeth to look pretty, but want to have a smile that is simply awesome, then you can easily achieve it through the help of a headgear.